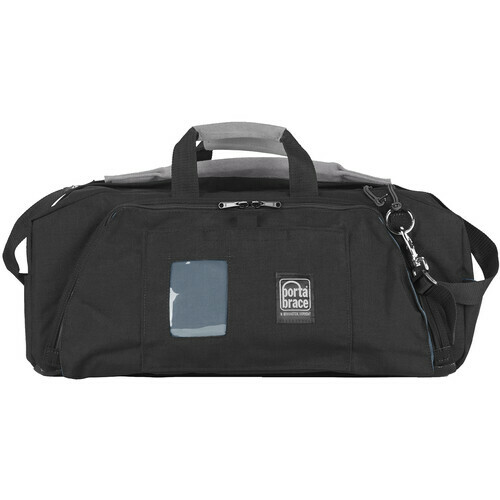 The Porta Brace RB-2 Lightweight Run Bag, Medium (Black) is designed for news and production crews. The bag stores spare tapes, batteries, cables, microphones and other audio/video accessories. The main compartment is foam padded, with a padded rigid bottom. Two sewn-in dividers span the 7.0" width with a 12" divider in between. The long divider has a zippered slip pocket. On the outside there are two large zippered compartments for cables or other items. Fold them out of the way for one large compartment. The RB-2 has a zippered facing to keep even more water out, should the case be left out in the rain. 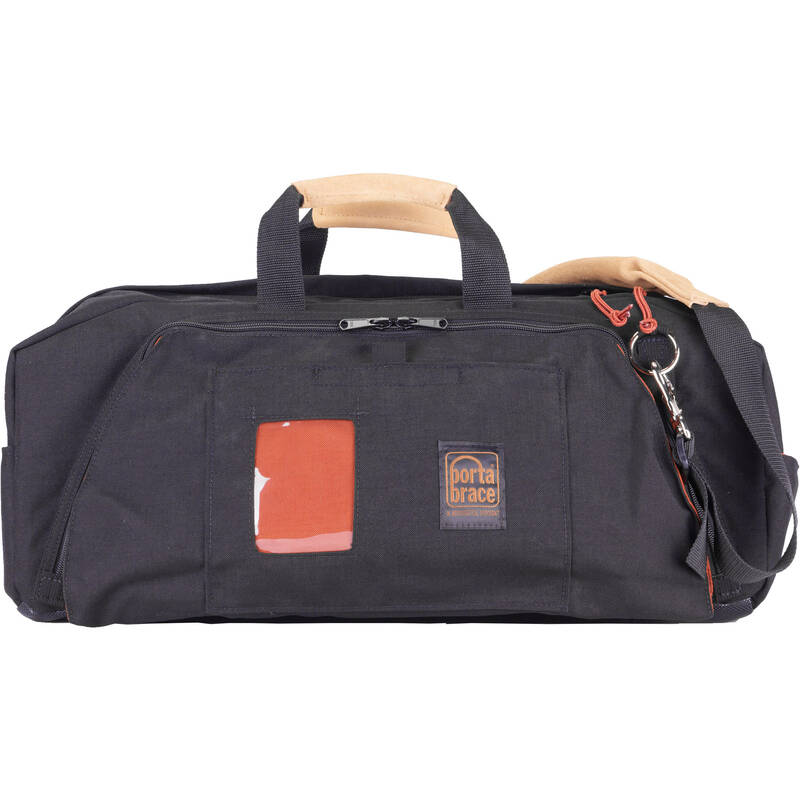 It is carried by straps with suede leather grips, and a suede leather, medium-duty shoulder strap. A bottom layer of Slip-Not water-barrier fabric with an easy wipe-clean surface has been added. Box Dimensions (LxWxH) 20.3 x 13.1 x 10.2"
RB-2 Lightweight Run Bag (Black) is rated 5.0 out of 5 by 7. Rated 5 out of 5 by Balthasar from versatile and lightweight I use this bag for sound equipment. With its flexible inside, I have 4 separations. Every project needs its own stuff, and this bag can easily be packed with the new daily needs. Over and over, always with a perfect order to work quick just out of the bag. What I only miss is the possibility, to put velcro everywhere, as I saw it in other bags. Here, the material is made from a strong fabric, but not this velcrotype. With this, it would be just more flexible and a dream of a bag. Rated 5 out of 5 by Wing @ sound designer from sturdy bag This bag is made soundly. Equipment is firmly protected by built-in buffer. Much equipment also enters. I put sound devices 702, Rycote windshield, headphone, Microphone stand, Sony PCM D-50 in this bag and go for field recording. Rated 5 out of 5 by DD35Jedi from More room inside than there looks I use this as my Grab-n-Run bag. I can easily carry a 25' mic cable and 25' video cable in the outside pockets, stuff a small tool box inside, as well as my lens filters hand wipes etc. etc. Extremely well built. Rated 5 out of 5 by camerahack from 3rd portabrace run bag in 26 years! No reason to expect this won't be as good as the last two. there are not many run bags you could treat so roughly and get ten years plus out of. Fantastic quality, tough and useful, highly recommended. Rated 5 out of 5 by SAIK Productions from Just a dope bag period. Great for using as a camera assist bag. Love the compartments. Great size. Actually wouldn't mind getting the Small size next time as well. Rated 5 out of 5 by Anonymous from I would buy this product again and again Good quality. Good ergonomics. Lots of space. Rated 5 out of 5 by Anonymous from Right Bag .....no other item in the arsenal of photographic gear begs to be just right like your bag...so simple....so tricky. I could open my own store featuring bags and cases only. Well, you guessed it......you always need another bag for that new piece of equipment you just bought...hopefully at B&H. And that is exactly where I went for this Porta Brace Lightweight Run Bag that was so far the perfect fit for my stuff. These Porta Brace bags are beautifully made and are set up and operate like they were designed for you....pure precision. I purchased this bag thinking it would be the final fit for my work. Whoops! I just added a new set of microphones for shooting second system audio and discovered I actually could trim my kit and use a smaller bag. Voila! I checked on the B&H web site and sure enough there was the smaller version of this bag. I contacted customer service and as if I were trading tools with my neighbor, the folks at B&H made it simple to return the bag and get the new smaller one. I could of course go on telling you more about my photo equipment and how difficult it is to keep the weight down when you travel these days, but you need information you can use here and I can tell you that the best fit will be found when you connect with B&H.